distribution Nearly throughout the mountains and Piedmont foothills. Scattered records near the Fall Line of the eastern Piedmont and upper Coastal Plain, but of uncertain presence in most of the central and eastern Piedmont. This central and eastern portion of the Piedmont has been rather well worked -- especially the Triangle area (Wake, Durham, and Orange counties), and thus the species may be truly absent in much of the middle of the state. There is also an odd gap in the northern mountains, where there are no known records between Mitchell County and the VA state line. abundance Uncommon to locally fairly common in the mountains, but seemingly rare (but likely not absent) in the northern mountains. Uncommon (at least locally) in the northwestern Piedmont, but very rare eastward, with no recent records between Forsyth, Davie, and Rowan counties on the west and Halifax. Harnett, and Richmond counties on the east. Very rare to locally absent (?) in the central and eastern Piedmont and western edge of the Coastal Plain. In fact, there are no records since 1998 for these Fall Line counties. flight Mainly mid-April to mid-August, at least in the mountains, and probably also in the Piedmont. However, records downstate are only from late April to late June. habitat Rivers and large streams, usually where rocky and with moderate current. 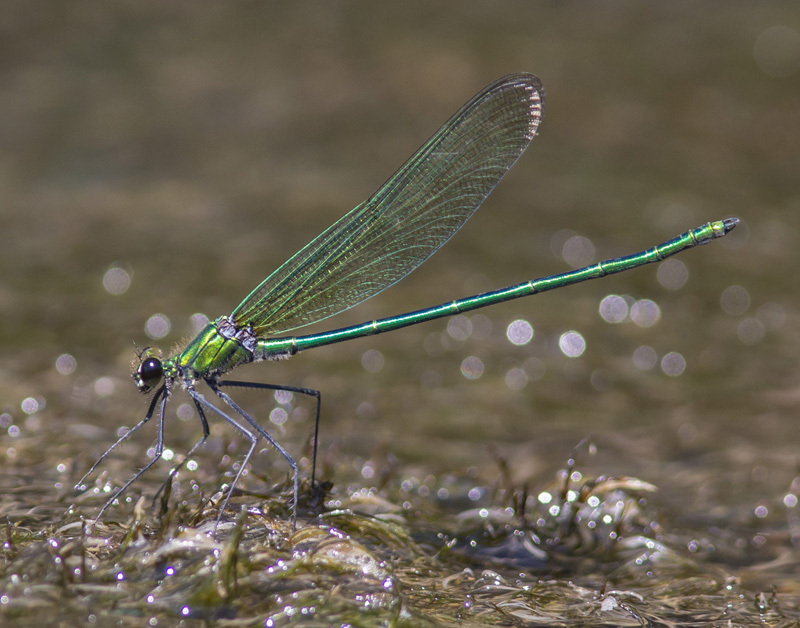 comments The gap in the range in the Piedmont is most unusual, and might actually be real, as there has been much odonate field work conducted in the eastern half of the Piedmont. Any records east of the western Piedmont are greatly needed to clarify this range. Perhaps the northern mountain counties are too high in elevation for this species; records are needed in this region, as well, to fill an odd gap. The fact that there are no records east of Forsyth County since 1998 is clearly a sign of recent declines in the population near the Fall Line, as this should be an easily identified species. Comment: Rowan, 2017-06-02, South Yadkin River at Bullhole River Park, Cooleemee. - Male.